Most of our patients are surprised to learn about the connection that chiropractic care shares with pregnancy. Pregnancy involves four distinct stages during which a well-functioning nervous system will greatly benefit both the unborn child as well as the mother. Chiropractic treatments can lead to births which are less painful or difficult, as has been reported by many pregnant patients. Many pregnant patients often report shorter, more pleasant deliveries when they receive chiropractic care. Prior to conception, chiropractic treatment can aid the body in being ready for what’s to come by ensuring that it is as strong and balanced as it can possibly be. In addition to providing you with useful advice, your chiropractic appointments will also result in the positive enhancement of both your hormonal levels as well as your immune system. Many women have sought out chiropractic treatments before becoming pregnant in order to optimize their health and the health of their future children. Your doctor will be well prepared to help prepare you for each of the bodily stages of pregnancy, all of which are determined by your nervous system. When it is functioning at its best, you’ll almost certainly have an easier time. For many patients, fertility problems are actually the direct result of nervous system issues—which can be addressed through chiropractic care. Nutrition and stress also play a part, and a qualified medical professional like the ones at our practice can help guide you through all of it. Chiropractors specialize in optimizing the nervous system and its functionality and can counsel you about the best ways to keep everything in good working order before you become pregnant. Keep in mind that chiropractic treatment can almost always be utilized alongside other solutions to infertility. Working in tandem with your other approaches can improve the likelihood of success with other approaches, including medical ones like IVF. Many patients have come to rely on chiropractic treatments to increase the functioning of their bodies, particularly for the hips and back. This will often result in a lessened need of pregnancy interventions. In fact, the founder of the ICPA—that’s the International Chiropractic Pediatric Association, an entire organization dedicated to exploring the benefits of chiropractic treatment before, during, and after pregnancy—is responsible for putting together and effective treatment plan which was specifically designed for pregnant women. This approach is called the Webster Technique, named after Larry Webster. At this time, the ICPA suggests that mothers undergo chiropractic treatment throughout their entire pregnancy, including prior to conception. This can help to promote balance in the pelvis and back areas of the body, which will help the baby by providing them with more room, since the body will become more flexible. A pelvis which has been properly balanced results in unborn infants shifting into the proper position for birth—thus reducing the likelihood of breech births and the issues which may occur as a result of them. This makes the labor substantially easier, safer, and less painful for the mother. An infant experiences some degree of stress on the spine during even the most successful births. If the infant has subluxation, this can result in a number of problems, including latching while breastfeeding since the child will have more difficulty turning its head and swallowing. Special techniques are used for women who have recently given birth in order to provide treatment which is both comfortable as well as safe. 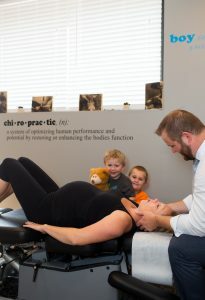 Chiropractic professionals understand which parts of the back require attention for both mothers and newborn babies, who often benefit dramatically from chiropractic adjustments. We use special approaches to make our adjustments safe and comfortable for you and your child. Knowing exactly where to adjust, newborns and infants are adjusted with no more pressure than you’d use to test the ripeness of a tomato. Many parents have commented that they see almost instant improvements in the well-being of their child. Will chiropractic adjustments harm my child? No. This is a common concern among parents who mistakenly think their child will receive adjustments like the ones they receive. Chiropractors are medical professionals who understand the fact that an infant’s anatomy is much different from that of an adult. Not only are adjusting techniques modified for each person’s size and unique spinal problem, an infant’s spine rarely has the long-standing muscle tightness seen in adults. This makes the energy needed to adjust a child’s spine considerably less than an adult’s does.This is generally the cause for concern by parents—they mistakenly believe that the treatment a child or baby will receive is the same as they would as an adult. It is considerably more gentle. Is it possible that chiropractic adjustment can make my spine “too” loose? No, because during your appointment, the Doctor will only be adjusting the areas of the spine that require treatment. This allows weakened muscles and ligaments to stabilize and heal. Why is chiropractic treatment during pregnancy beneficial? Being born is a natural phenomenon. It’s what we’ve done to the birth process that has become increasingly suspect. In hospitals, birth is often treated like a disease. A newborn’s introduction to the world is often accompanied by a severe drop in temperature, loud noises and other in-sensitivities. The administration of drugs and anesthesia can have a profound effect on a newborn. 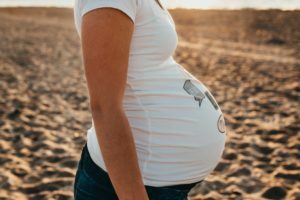 Will my doctor agree that chiropractic treatments are beneficial during pregnancy?